What’s On My Macbook Dock? Since I have previously shared a post called My Essential iPhone Apps, I thought I’d take a moment to share the apps that I use on my MacBook Pro on a regular basis. Of course, there are the irrelevant ones such as Finder, Calendar and System Preferences that I won’t bother to list down below… but they are there. 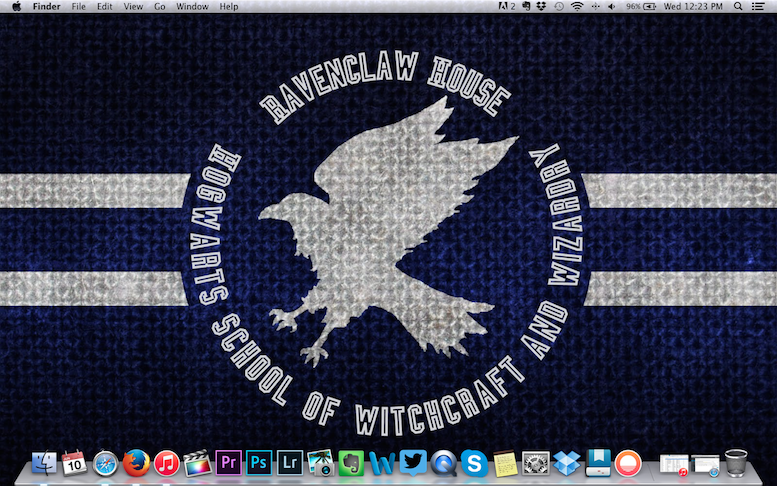 As you can see, my Ravenclaw pride shows just about everywhere. I’ve had this background for over a year now, and I’m honestly not planning on changing it anytime soon. Anyway, here are my Mac Apps, from left to right. Safari & Firefox – Though by default I use Safari to do all my web browsing, I often use Firefox when it comes to my job so that I can easily do my work without having to log into different Gmail accounts and whatnot on Safari. iTunes – Pretty self-explanatory. This is where I keep my thousand or so songs stored and listen to music while I blog and such on my computer. Final Cut Pro X – The primary tool in my job – editing video content. Though some have their criticism about it because of it’s similarity to iMovie after the 2013 update from FCP7 to FCPX, I still like it once I took the time to get used to the changes. Adobe Premiere Pro CC – Since many jobs require using Adobe, I downloaded this app to familiarize myself with it. Honestly though, most editing software is basically the same, so there is nothing that is totally different… other than the layout and keyboard shortcuts. 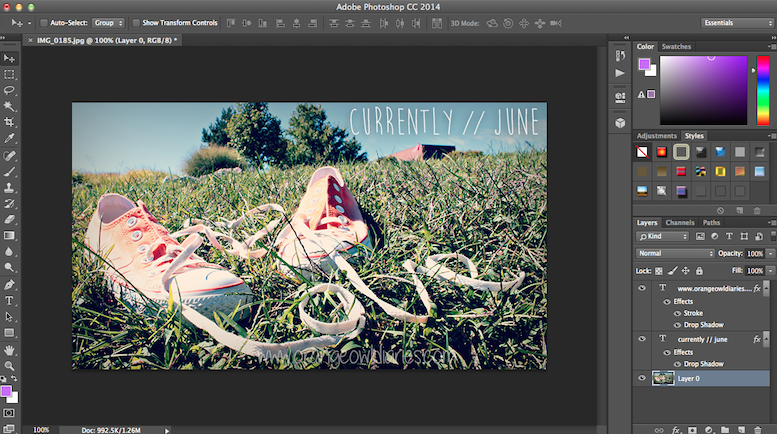 Adobe Photoshop CC – It took me years to finally get myself Photoshop and learn how to navigate it! 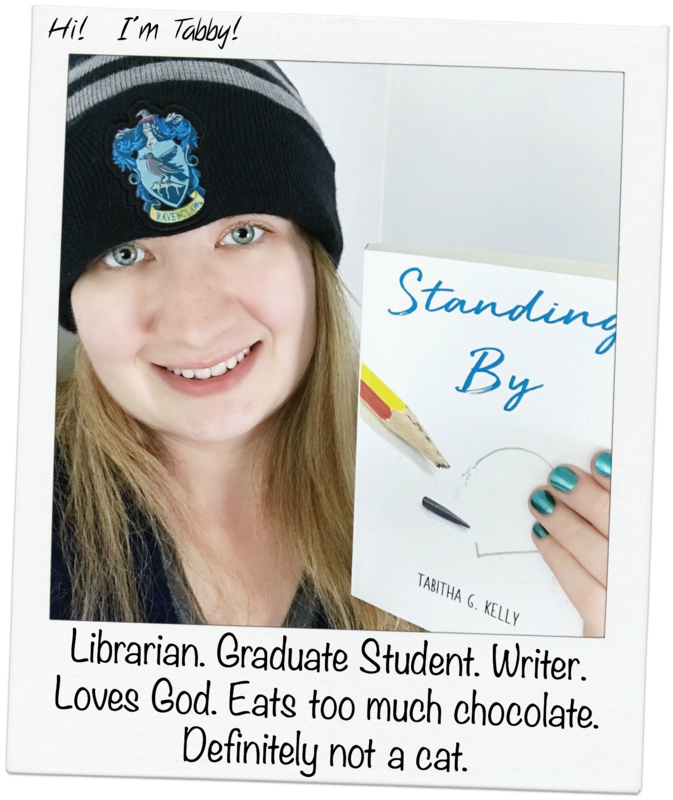 I primarily used PicMonkey and its predecessor Picnik for photo editing, but now I can’t function without using Photoshop – especially now that I use it for editing my blog photos! 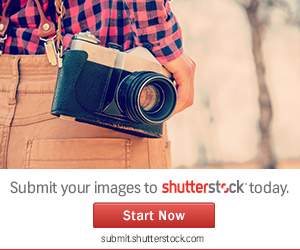 Adobe Photoshop Lightroom 5 – I don’t use this app as much anymore, but once in a while I still use it. iPhoto – Only once in a while I have to use iPhoto to transfer video files from my JVC camera to my external hard drive. Otherwise, it just sits there. Evernote – I used this all the time back in the start of my last year of college for taking notes in my Psychology class. I still use it to keep track of notes for my blog and other ideas I might have, but it doesn’t get the same amount of usage as it did nearly a year ago. Word for Mac – Where I write pretty much all my stories and fan-fiction stories. Oh, and I guess I use it to keep my resume updated and to write cover letters, ha. 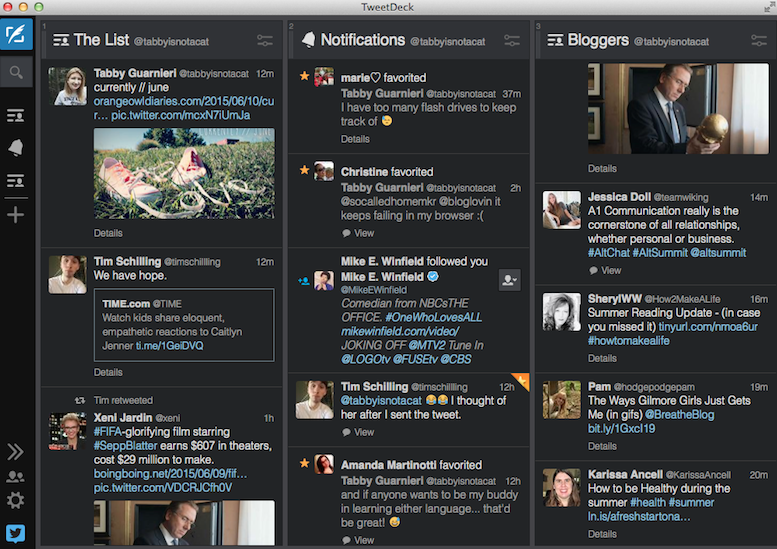 TweetDeck – My essential app for using Twitter on the computer. I don’t care to use the web version and since the App Store doesn’t have Echofan for the Mac… I use this. I really like that I can have separate columns to keep track of my timelines and notifications all at once (picture below). QuickTime Player – I don’t actually use this too often. Only when I feel like watching my past videos that are stored on my many flash drives. Skype – Again, not an app that I use too often. I’ve used it to chat with a friend of mine who lives in Arizona and I’ve tried to connect with some other friends, but they’re never available when I am. Notes – For quick notes, I use this over Evernote. But let’s face it, Evernote is much more efficient and should be preinstalled on Macs instead of this one. Dropbox – This app has saved my life numerous times… for school purposes anyway. But I still store quite a bit in my dropbox, which frees up space on my Mac’s hard drive. Day One – A journaling app that I use sporadically. I’m trying to get into regular journaling, and for me typing is much easier than handwriting. There’s also an iPhone version that you can sync up to so I can journal on the go! Sunrise Calendar – I literally just downloaded this to try to get some organization into my life. I’m not sure how well this will work out, but only time will tell. What apps do you use regularly on your computer? Are they similar to mine, or do you have different ones you prefer to use? Photoshop and Lightroom are a must-have on my dock, as is iPhoto, so that I can easily drag and drop all my photos for editing, both for work and for my photography on the side. Also Mail, because, well work, and Google Chrome, because it’s the only browser I use now. I have the Twitter app for my work twitter account (I rely on the browser version for my personal one), my calculator, calendar, and pages. Eventually, once I have the funds to upgrade my CC subscription to the full one, InDesign and Illustrator will also be on there. It’s not quite as ‘personalized’ a dock as my old mac was, mainly because this is both my work and personal computer, so it’s set up to be more easily accessible to my work stuff. I’ve only had this for about 3 months, so I’m sure the longer I have it the more personalized I’ll have the dock and the stuff on my desktop. I had Chrome, but for some reason my computer started acting up while I had it. After I got rid of it, the problem went away too… it was weird. It kind of sucked too because I really like Chrome. I’m sure your dock will get more personalized over time as well. And I love that you have Disney decals on it! I have an owl one on mine that I bought as soon as I got my Macbook Pro two years ago.